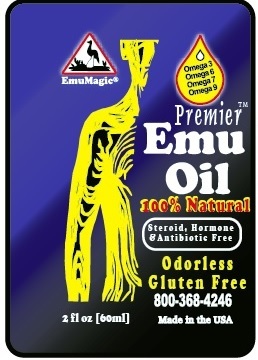 Contains: 100% Pure Fully Refined Emu Oil. 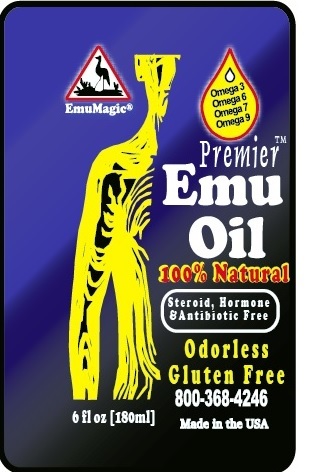 For thousands of years the emu oil has provided the Australian Aborigines with an oil consisting of Omegas 3, 6, 7 & 9 which has aided in soothing, cooling, moisturizing and beautifying skin. For more information, please call us! This notice is required by the Federal Food Drug & Cosmetic Act. The written and pictorial contents of the EmuMagic website are for informational purposes only. The content is not intended to be a substitute for professional medical advice, diagnosis, or treatment. You should always seek the advice of your physician or other qualified health provider and ask any questions you may have regarding a medical condition. The dietetic products that are taken internally are not intended to diagnose, treat, cure or prevent any diseases. Always consult your medical professional if you are pregnant, lactating, or have any other health conditions before applying or taking these products. *Statements made are not based upon clinical studies or representations of Minnesota Emu Inc. They are the comments and observations of actual product users. Minnesota Emu Inc. recommends the use of medical professionals in the diagnosis and treatment of every illness. Information regarding the use of EmuMagic products comes from the published research, industry association reports, published materials and user testimonials. ©2017 EmuMagic®. Website by Arvig® | SmartSearch.